Sothink SWF Quicker A power SWF files editor, lets you author Flash (*.swf) with a friendly user interface and plenty of useful features. It supports shape design, motion tween creation , guideline, mask layer, stream and event sound, frame label, setting movieclip instance name and more. 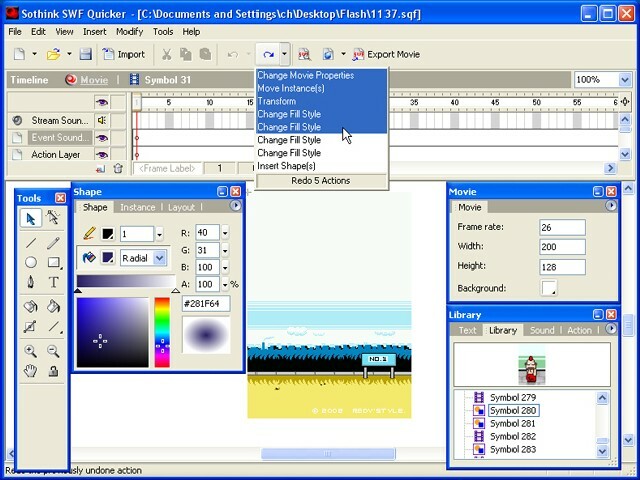 The program includes more than 80 ready-to-use animation effects, which can be further customized and saved as new effects. Additionally, multibytes language (Chinese, Japanese, Korean, etc.) text is supported perfectly. Sothink SWF Quicker also offers the capability to import SWF files, using an intelligent motion analysis system and full action support. The imported movie can be modified and generated back to a new SWF movie without losing any functions of the original one. Additional features include an ActionScript generator, symbol library and more. Sothink SWF Quicker is a SWF editor. After you import a SWF file, the program offers you the ability to edit SWF just the same as you have FLA file. Once you lose the FLA file, you do not need to worry about how to convert SWF to FLA so as to make the modification. Just within SWF Quicker, you may edit SWF file of almost all the elements, such as ActionScript, Text, Shape, and URL, in your desired way, totally without FLA. Image Format : Supports common image formats including BMP, JPEG and PNG. Even more it supports importing existing vector graphics such as AI, SVG and WMF/EMF. Sothink SWF Quicker also provides a professional ActionScript editor which can help users to directly write ActionScript or edit imported ActionScript with assistants of Syntax highlighting, Auto member list, Parameter information and Auto code completion. Motion Tween creation: Motion Tween, Guided Motion and Mask Motion. Import and edit an exist Flash movie . Support multibytes language text . Easy-to-draw Guide lines of various kinds . Float and organizable panels . Stream sound and Rich Format Text. Common ActionScript to better control a movie . Library panel to store symbols . After you import a SWF movie and finish editing, you can export the movie as a *.swf file as well. Furthermore, the Publish Wizard will help you insert SWF movie into an HTML file. Amor SWF to VCD SVCD DVD Creator & Burner - converts your Flash swf files to compliant Mpeg, VCD, SVCD or DVD structures (VOB and IFO). Hot!